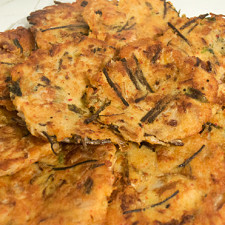 Savory pancakes (전 – jeon) are common in Korean cuisine as a banchan or appetizer. 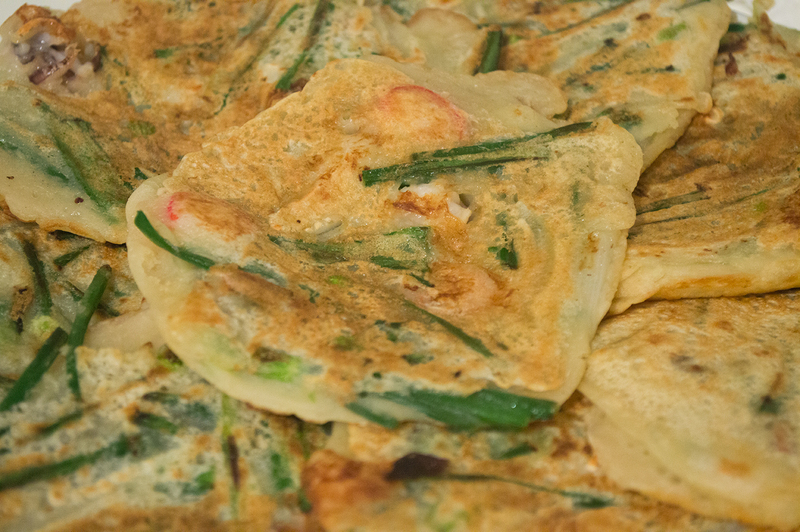 Seafood Scallion Pancakes (해물파전 – haemul pajeon) are just one of the many kinds of pancakes out there. 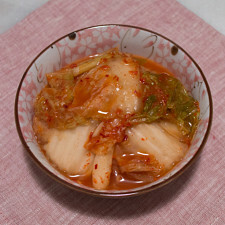 They are found in many Korean restaurants where you can share with a group of people. Oftentimes, it is made with the intention of sharing, although my mom makes them smaller and thinner (and without seafood — simply called pajeon, or scallion pancake –, because my sis is a vegetarian) for portioning. They’re just the right mix of sticky, savory, sweet, crispy, and crunchy. My mom uses the ready-made Korean pancake mix, but I find that it doesn’t fry up as crunchy and crispy. My hubby and I decided to create our own dry mix for the scallion pancakes to make ours crunchier, because who doesn’t like that? 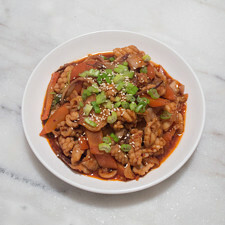 Take a small pan, and lightly toast the rice flour, about 5 minutes, on low flame. In a large bowl, mix all of the dry ingredients together. Set aside. 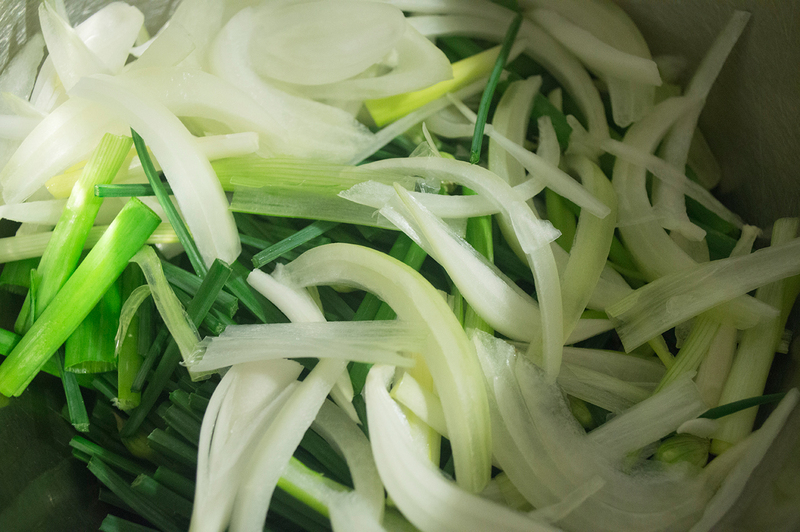 Wash, trim, and cut the scallions to 2 inches in length. Do the same for the garlic chives, remembering to trim and remove the fibrous ends (about 2 inches up from the base). Slice the onion into ¼-inch thickness. Add all the cut greens into a large bowl with the minced garlic. Set aside. 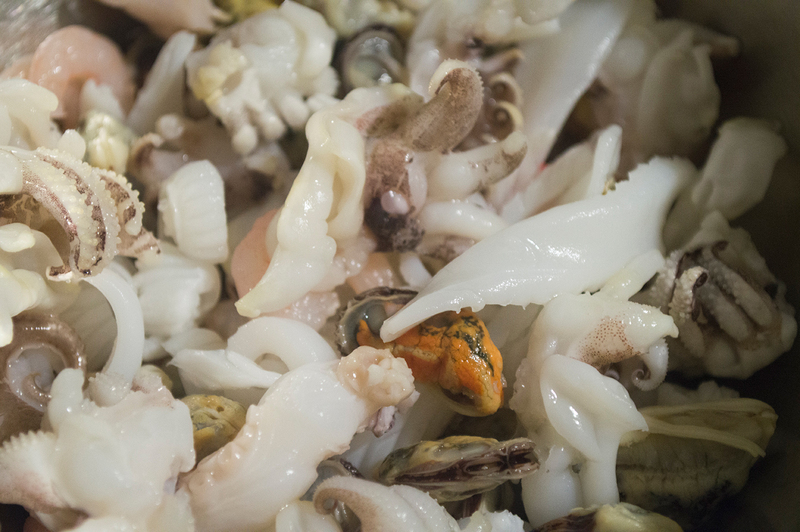 In a small bowl, wash the mixed seafood under cold running water and drain. 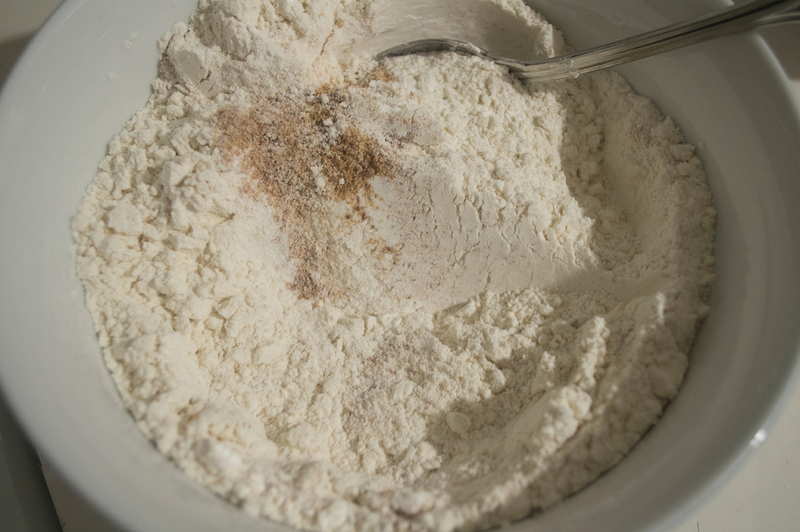 Empty the dry ingredients into the vegetable bowl, roughly stir together, then pour all of the water into the vegetable and flour bowl. Mix well, but do not overmix. Add the seafood medley and mix just until evenly distributed. Let the batter sit for about 10-15 minutes to allow for even hydration. Make the dipping sauce by mixing all of the ingredients together. Set aside. In a large fry pan, add enough vegetable oil to cover the bottom, about a ½-tablespoon. At medium flame, fry the pancakes until nice and golden brown, about 2-3 minutes on each side. Fan them out onto a large plate or wire cooling rack to prevent soggy pancakes. Enjoy eating them hot with the dipping sauce! Don't be pressured to make a full batch of two dozen scallion pancakes. You can easily cut this recipe in half. My hubby and I make a large amount, and cool, package, and freeze them for later consumption. To re-heat: microwave, pan-fry, or bake on a cookie sheet with parchment paper. Additionally, the pancakes can be made larger than the 5-inch size, perfect for sharing with friends and family. 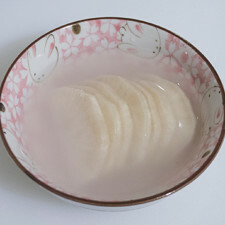 We lightly toast the rice flour to give the pancakes a nice flavor. Korean pancake mix is readily available in Korean grocery stores. Instead of my dry mix, you can substitute about 440g (3½ cups) of pancake mix. I like my pancakes to have a lot of filling, but you are definitely welcome to add less greens. The above measurements for the vegetables are just a guideline. You can choose to add only scallions or only chives, although having a good mix makes the pancakes tastier. The seafood medley is optional. My mom still makes these without seafood and adds sliced green chilies or thinly sliced zucchini. If the batter looks thick (it should be slightly thinner than buttermilk pancake batter), add a splash of water. Conversely, if it's too thin, add some all-purpose flour or Korean pancake mix. To speed up the process, use a non-stick griddle; utilize the space and make a few scallion pancakes at a time. Add a teaspoon of minced ginger or some chopped onion into the dipping sauce to give it a different flavor. 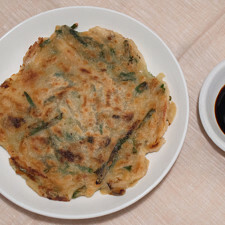 Made our Recipe for Haemul Pa Jeon (해물파전) - Seafood Scallion Pancakes? Here are the dry ingredients mixed in a large bowl. The seafood mix: squid, mussels, fishcake, shrimp. Here’s the batter all ready to go! 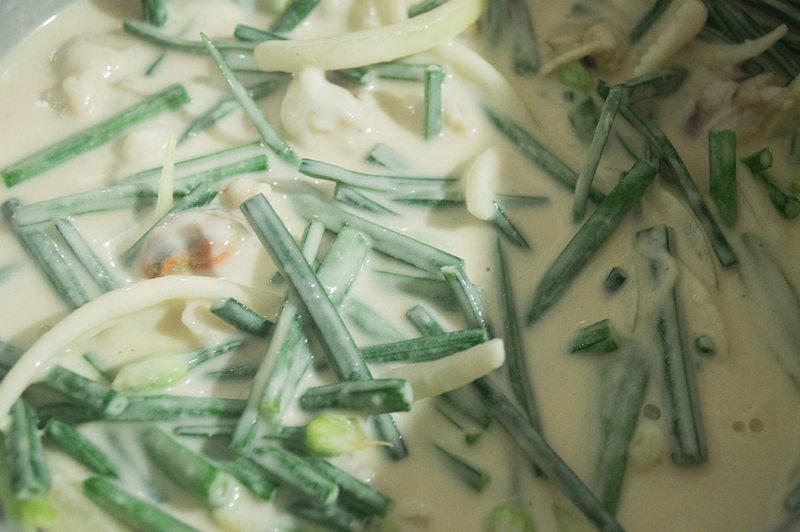 No thoughts on "Haemul Pa Jeon (해물파전) – Seafood Scallion Pancakes Recipe."